In the framework of the International Forum of Eurasian Partnership Vesti.am spoke with the President of the Association of Russian Banks Garegin Tosunyan on the subject of the creation of unified banking system on within Eurasian Economic Union. He noted that the creation of a unified banking system in the Eurasian area should be carried out so as not to damage the interests of the separate EAEU member states. – I don’t think that that there will be a unified banking system, each country will develop its own banking system while cooperating with others. I believe that taking into consideration the cooperation between Russian and Armenian banking systems, that is not implemented poorly, we can hope that it will contribute to the cooperation in a joint economic zone, – he said. As for the transition to the single currency Tosunyan noted that it will not become a reality in the near future, but in the midterm, long term, is possible. He emphasized the importance of the International Forum of the Eurasian Partnership, which is organized by the president of the Union of Armenians in Russia Ara Abrahamyan. – Such forums are important in order to get acquainted with common interests. 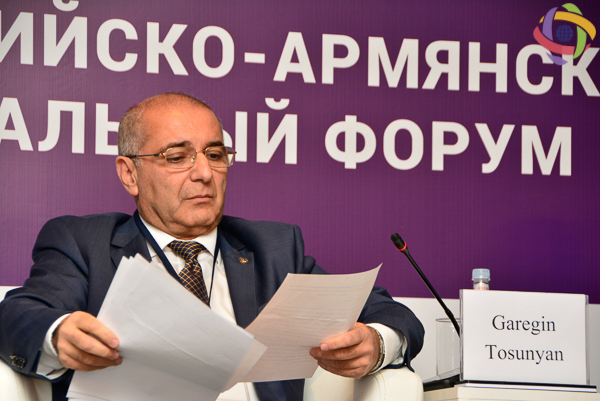 In general, when the barriers to the mutual understanding are removed, the issues of economic and political integration are minimized, – Tosunyan concluded.